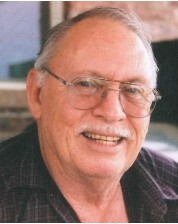 Frank Neal Harris, 84, of Duncan, Oklahoma passed away Sunday, February 10, 2019 at his home in Duncan. Funeral services will be held on 10:00 AM Friday, February 15 at Don Grantham Funeral Home Chapel. Interment will follow at Rose Cemetery in Hobart, Oklahoma under the direction of Don Grantham Funeral Home. Military honors will be provided by the Stephens County Honor Guard. The family will receive friends at the funeral home Thursday evening from 5:00 PM to 7:00 PM. Frank Harris was born Sept. 8, 1934, in Rocky, Oklahoma to Clifford and Leeta Bell Harris. Frank graduated from Rocky High School in 1952 and graduated from Southwestern Oklahoma State University in December 1958. Frank was a long time educator as a teacher, coach, and administrator, having completed his career at the State Department of Education. Frank also enjoyed collecting coins and antiques, and loved animals, especially dogs. He really enjoyed watching his children and grandchildren play different sports and he loved OU football and Thunder basketball. Frank married Jodie Mae Lomenick in August 1956 and they had five children together. He married Marge Wolfe and then married Carol Preble in 2000. Frank is survived by his son, Dale Harris, of Duncan, OK; daughter and son-in-law, Melanie and JR Wheeler of Altus, OK; daughter and son-in-law, Valerie and Bobby Williams of Walters, OK; son Keven Harris of North Richland Hills, TX; son and daughter-in-law, Kirk and Julie Harris of Marlow, OK; and stepdaughter, Kristy Barnes; his grandchildren, Dallas and his wife, Deanna; Justin and his wife, Sarah; Ashley Wheeler, Cody Wheeler; Frank Williams, Matthew Williams; Charissa Rodriquez and her husband, Wally; Payton Harris; Halston and his wife, Jill; Brock Harris, Blake Harris, and Blayd Harris; seven great-grandchildren Katelyn, Justice, Jagger, Aizlyn, Aspyn, Easton, and Hollyn; brother Dennis Harris, sisters Dolores Butler and Leeta Gayle Harris and many nieces, nephews, and friends. Frank was preceded in death by his parents Clifford and Leeta Bell Harris, his brothers Jerry Harris and Jay Will Harris, a daughter-in-law Sandra Harris, and his wife Carol Preble. Pallbearers will be the grandsons of Frank Harris. In lieu of flowers the family has asked that memorial donations be made to the Stephens County Humane Society.